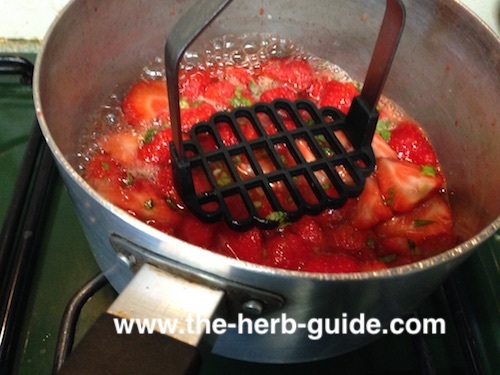 A strawberry basil jam ready in around twenty minutes? I didn't think so, and I'll forgive you for doubting it - but it's true! Follow along with the step by step photos or watch the short video I've made - at the bottom of the recipe instructions. The basil is optional, so don't let the fact you haven't got any stop you giving this a try. You can always put some in next time. I shall most definitely be making this frequently - take advantage of hedgerow fruit and marked down fruit at the supermarket. You can even use frozen fruit for this. Freeze your own fruit or buy it. I think this is the perfect way to prevent wastage of that odd bit of fruit left in the bowl at the end of the week. Chop it up and put it in a bag in the freezer to use to make preserves. 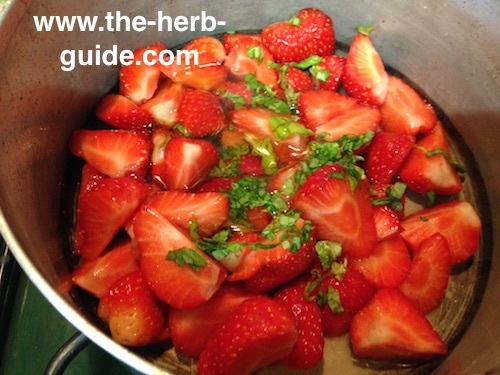 Cut up the fruit and add the honey, lemon juice and chopped basil. After this time, using a potato masher or the back of a spoon, crush the fruit until it's the texture you like - chunky or smooth. 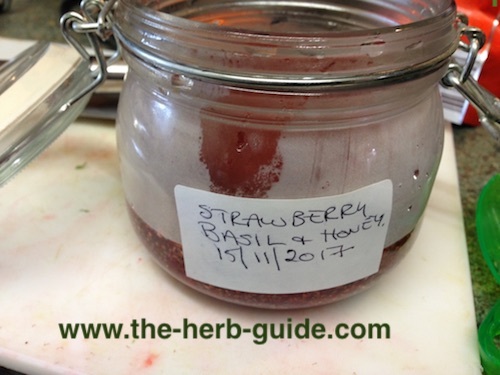 Taste the fruit mixture at this point and see if you need to add more lemon juice or honey - it's going to be a personal taste and neither of them will make a difference to the finished consistency of the jam. That's down to the chia seeds. Add 2 Tablespoons of chia seeds and stir through. Let the jam sit for about five minutes and see if it's thick enough for you. It will thicken a little more as it cools and sits for longer. 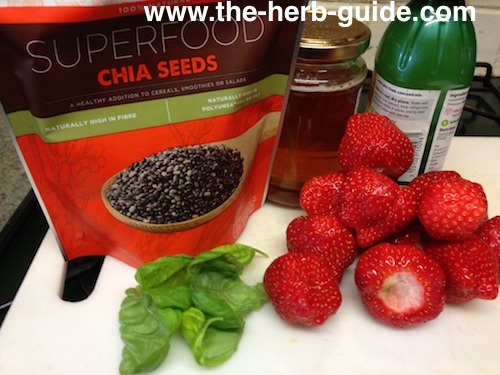 If you want it thicker, add chia seeds one teaspoon at a time. You don't taste the chia seeds, nor do they appear gritty in the mouth. It's just a smooth strawberry chia jam. 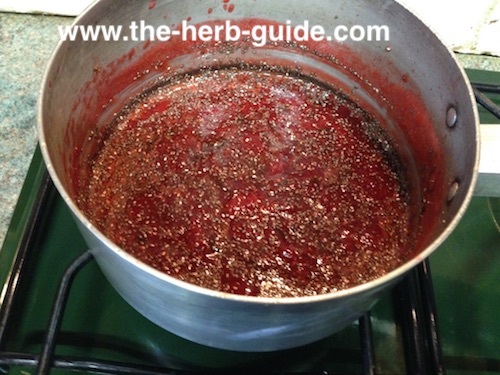 Pour the jam into a clean glass jar. Label it with the date you made it. It will last for two weeks in the fridge or you can freeze it. Defrost in the fridge and it will last two weeks from then. It's so simple, it's worth making up small quantities of jam out of bargain or free fruit - 20 minutes or less to preserve your fruit - marvellous! 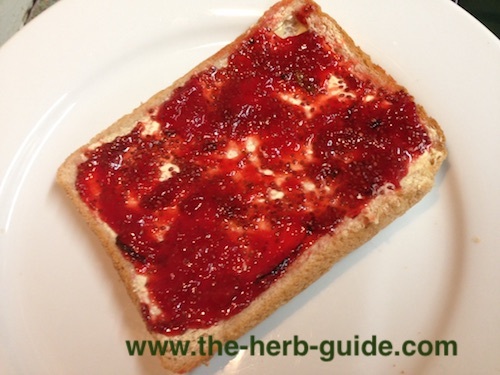 Now look at that - a slice of bread and butter thickly spread with homemade strawberry basil jam - it tastes so fresh, you really can taste the strawberry in this, not heavy with sugar at all, but delicately flavoured with the honey and basil.